We all need traffic. Targeted traffic to our websites that’ll convert. SEO, PPC ads, organic social media posts, blogs, email newsletters, a culture manifesto – you name it, it’s gotta be written. Lots of founders struggle with writing. Specifically, they struggle with confidence in their writing abilities. But, that’s not because they aren’t good writers. According to Anne Hadley, “Everybody Writes.” You’ve only got to tap into your courage and learn how it’s done efficiently. On top of the confidence thing comes the time issue. Founders wear many hats, especially in the beginning. So, how can you find the time to dedicate to writing? You’re in luck, my friend. We’re going to teach you how to conquer the content beast in a matter of an hour per piece of content. You can’t write efficiently if you’re worried about what everyone is going to think. You might not think you can write, but ask yourself, how many emails have you written this week? Slack messages? Texts? The answer is plenty. Thanks to tech, humans write regularly. You’re might say to yourself: Yeah but, I don’t remember all those rules from 5th grade, who or whom, less or fewer. Plus, I don’t think people would want to read what I write. I don’t know if it’s good enough. And honestly, don’t sweat grammar. I find typos and grammar errors in plenty of the books I read – just found one in a John Grisham novel, and no one is going to take him off the New York Times bestseller list because of it. Below are two free tools that many of the best writers are using to correct minor grammar errors. What good is our writing if there’s no one who’ll read it? Often, the most nerve-wracking thing is wondering, what the heck does my market want to read? Instead of asking yourself what your market wants, ask yourself what you would want to read. What content do you like? What blogs help you be better at your job? What industry blogs inspire you? Write that kinda stuff. Think about the content you like. You probably appreciate it, and share it, because it provides real value. It teaches you a new marketing hack or a new way of fixing a backend issue. This might seem counterintuitive, but the fresher the idea, the better. And the best content usually contains some I.P. For example, instead of writing another article about SEO, find a unique angle – something that hasn’t been said. Maybe it’s, “HTML hacks for marketers without coding experience that will improve your SEO rankings.” Don’t be afraid of a long title if there’s value to be shared. When I started writing content, my fav blog posts were by Neil Patel and articles on Copyblogger and The Writing Cooperative. I tried to mimic their styles until I developed my own. There is no secret sauce to developing your style – it just comes over time as you write more. Don’t spend time thinking about your “style” or “tone.” Those worries are a waste of time. Earnest Hemingway was all about this little rule. An adverb is a word that modifies a verb, phrase, or another adverb or adjective. Adverbs are hell on paper. They junk up your writing. They un-clarify. Have you considered how truly awful it will be to calculate all those metrics without software? Truly (the adverb) just junks it up, takes up space, and doesn’t change the meaning or emphasize the question. When a writer says something’s awful, we believe them. What’s the difference between something awful and something truly awful? It’s just clutter. Have you considered how awful it will be to calculate all those metrics without software? Without ~~truly~~, the word awful can do its job. Big words are overrated. Don’t come off as a know-it-all when you can be precise and straightforward. Don’t use too much jargon. When you’re in a defined niche or industry, it may be hard to avoid certain jargon words. Example: If you cater to SaaS businesses and you say things like, “MMR, churn, etc.” – this is fine because it’s educational. Just make sure you’re offering a clear explanation of your jargon-talk. Passive voice is when the verb comes before the subject. The kid threw the ball. The ball was thrown by the kid. Passive voice makes for weaker, less confident writing. Avoid it unless you can’t convey your point without using passive voice. Now that you’ve got these tools and lessons under your belt, there’s no reason you shouldn’t head into your next creation process with confidence. Remember: It’s more valuable to put out an imperfect piece of content than to waste too much time trying to get it perfect. Getting a solid process nailed down is key for creative work. Artists, writers, musicians, etc. need habits that get the creative juices flowing. And if you’re also managing a team, you need to get this done in a timely fashion. I used to spend a good chunk of time on research, but I learned a hack for cutting it down. Instead of writing about unfamiliar things, focus on either things you are already familiar with or something you’ve read about/learned recently. When you write about either something familiar or something recent, you’ll crank out your ideas quicker. You will also recall quotes, highlights, and links to research with less effort. Evernote: you can save notes to your phone/computer. The web clipper tool is great for saving articles and research notes via the Chrome extension. Remember: Don’t quote rando blog posts when the original research is available as a web link. 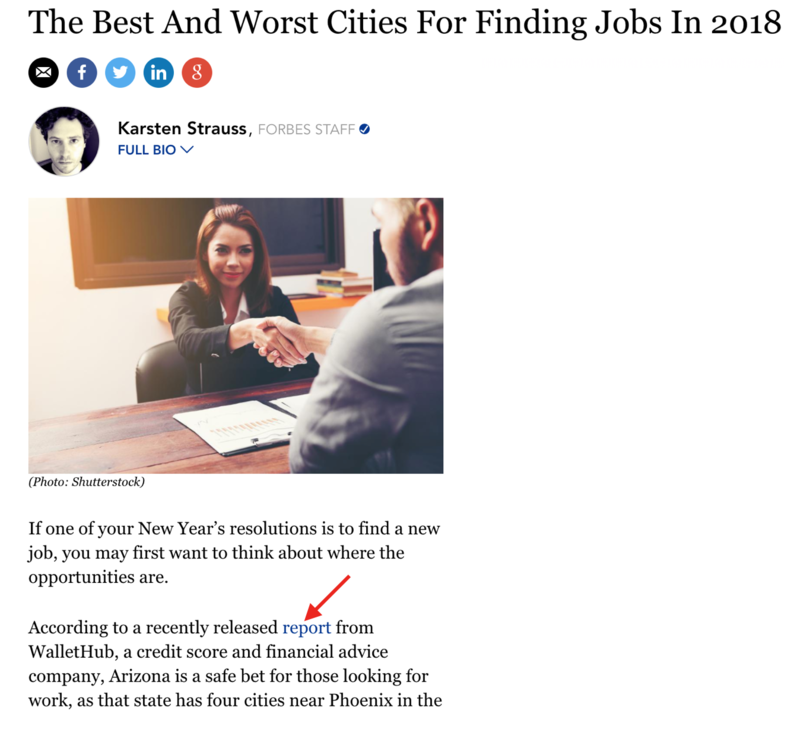 For example, if I`m going to cite this piece from a blog post on Forbes about the best place to find a job in 2018 – I’d click the link highlighted with the red arrow to see where that takes me. Ah, original research. That’s what you link to. Even though Forbes is an authoritative blog, it’s always best to link to the original, scientific/market research when possible. If I do a little more digging within the original research posted on WalletHub, I find that much of their data came from this report released by the U.S. Bureau of Labor Statistics. 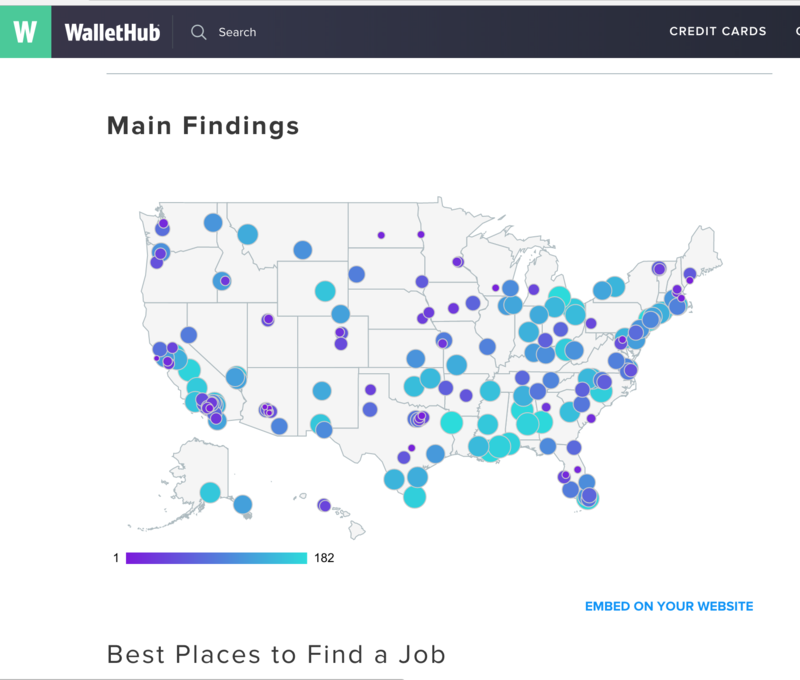 However, I’d still link to the WalletHub article, as they’ve analyzed the Bureau’s data for these unique insights. So now that you have a link to original research that you want to include in your writing – save it somewhere (notes on your phone, Evernote, etc.). I usually save research links with a bit of text reminding myself how I’ll use the research in my post. Now that you’ve got your research down and it’s fresh in your mind don’t hesitate to fluff everything out. Go all in during the drafting phase. One draft is plenty. You may or may not want to outline your article before you draft the fluff in between the subheadings. I like working with an outline because it reminds me what my goals are. It’s optional. Now it’s time to edit. Editing should take up the bulk of your writing time. Step 1. Walk away from your draft. Clear your head for a few minutes. Eat something, walk, have a cuppa. Whatever you want to do, so long as you’re not thinking about what you just wrote. Step 2. Come back with fresh eyes and reread the content. Start organizing it. Move that paragraph up to the top if it makes sense. Cut that sentence out, reword your first subheading. Make it make sense. Step 3. Get your grammar game right. Plop your content into Grammarly and edit the mistakes it catches. Next, put it into Hemingway App. Remove some adverbs. Reword the sentences that Hemingway says are hard to read. Make sure the reading level is 8th grade or lower. Step 4. Polish it up. Add in your research links where you need them. Add a gif, picture, or any other images you might need. Step 5. Reread it for grammar/clarity. Grammarly won’t catch everything, so if you’ve got a friend that can read through it, that’s even better. Another trick for catching errors is to start with the last word and read in reverse. Step 6. You’re ready to post and share. Canva – Create free graphics. There are lots of great templates and designs ready to use, including layouts for infographics. Coschedule headline analyzer – Check the strength of your title. I like to be above 70%, although, I’ve written headlines that were lower and they performed well. Cliche Finder – Get rid of your cliches. Unsplash – Find free, high-res photos to add to your posts. Make sure you give credit where credit is due. The more time you spend fiddling around with an idea, draft, etc. the more time and potential business leads you’ll lose. Be confident, be efficient, and post consistently. You’ll see your SEO rankings and organic traffic soar. Plus, with each piece you publish, you’ll be a better, faster writer.